SIXERS HIT A SPEED BUMP IN TORONTO, 113-102! If last night’s Sixers-Raptors game was a litmus test of sorts for the young Philly five, Toronto proved that they are still the beast of the East. 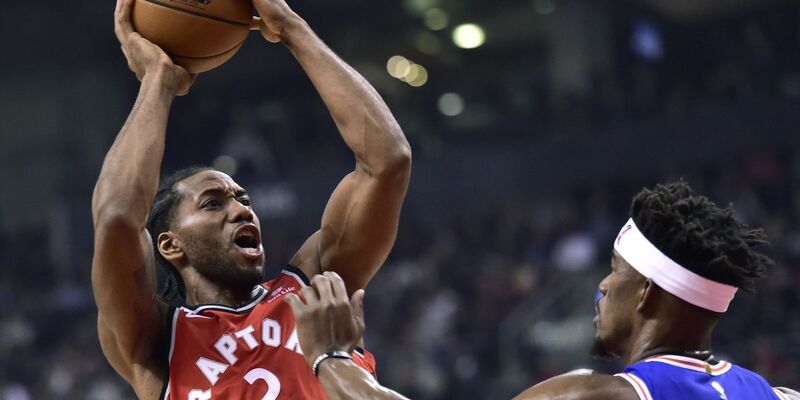 Kawhi Leonard (above) had 36 points, Jonas Valanciunas scored 18 of his season-high 26 in the fourth quarter and the Raptors won 113-102, handing the 76ers their 13th consecutive loss in Canada. Serge Ibaka added 18 points as the Raptors bounced back from Monday’s loss to Denver to win for the ninth time in 10 games. Toronto, with the best record in the NBA at 21-5, improved to 11-3 at home. The Sixers’ Jimmy Butler scored a season-high 38 points and added 10 rebounds. Joel Embiid had 10 points and 12 rebounds for Philly, whose last win in Toronto was 93-83 on Nov. 10, 2012. The day before, Brown suggested the game would be a “barometer” for the 76ers. 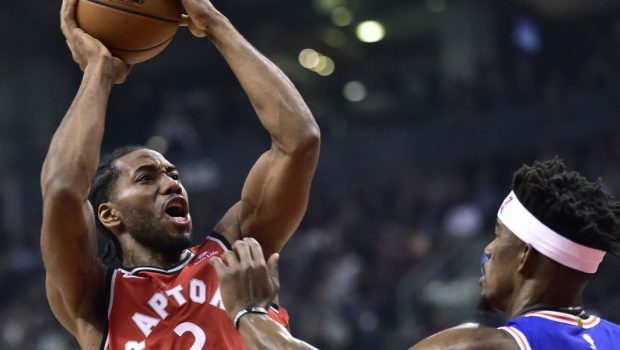 Afterward, he said his team’s 21 turnovers and 22 second-chance points allowed underscored the gap between the Sixers and Raptors. Toronto’s 17 offensive rebounds were a season high. “We gave ourselves a chance to win with our effort but the execution just wasn’t there,” 76ers guard JJ Redick said. Redick scored 25 points and Ben Simmons had eight points, 11 assists and 10 rebounds for the 76ers, who had their four-game winning streak snapped. Leonard shot 13 for 24, finishing one point shy of his season high, and set a season best by making five of six attempts from 3-point territory. The rest of the Raptors struggled from long range, combining to shoot 3 for 23. Leonard’s season high of 37 points came last Thursday in an overtime victory against two-time defending champion Golden State. Leonard has led Toronto in scoring in four straight games. Leonard, who set a season best with five steals, said he doesn’t let the opponent or circumstances dictate his effort. Leonard has never lost in 12 career meetings with the 76ers, including two victories this season. The Raptors held a 78-77 lead after three quarters, and the Sixers’ T.J. McConnell tied it 81-all with a hook shot at 11:07. Valanciunas scored a pair of baskets as Toronto’s reserves replied with a 9-0 run, opening a 90-81 advantage at 9:07. Previous CAN OUTSIDER CHUCK FLETCHER FIX FLYERS ROTTEN CULTURE? Next BENNY TO JIMMY: SIXERS BUTLER BANKS 2 OF HIS 38 POINTS, WATCH!